State of the State | The Vermont Political Observer. Yesterday, State of the State Address: Governor Shumlin introduces a variety of people whose stories illustrate the impact of his policies. They include two executives from GlobalFoundries and two from BHS Composites. The latter was a surprise entry; Shumlin sprang the news that BHS had decided to open a facility in the Northeast Kingdom, creating an estimated 70 jobs. The Emergency Board, which includes the four chairs of the Legislature’s money committees and Gov. Peter Shumlin as the chair, voted at a largely hush-hush meeting that started at 8:30 a.m. The Shumlin administration did not formally announce the morning meeting until Thursday afternoon, following his State of the State address. The information in the meeting’s agenda packet, which was printed on Dec. 29, was considered confidential. Hm. The agenda packet was printed eleven days ago, and the meeting wasn’t warned until yesterday afternoon — less than 24 hours beforehand. Okay, so the administration sat on the news so the Governor could make a splash. Great. But if Shumlin ever wonders why he has a reputation as a slippery dealmaker, well, here it is. This entry was posted in Business, Peter Shumlin and tagged BHS Composites, Emergency Board, Globalfoundries, mutual backscratching, State of the State on January 8, 2016 by John S. Walters. Pity our poor Lieutenant Governor. He had to sit directly behind Governor Shumlin during the State of the State address, and try to figure out what he should do with his face. Most of the time, he looked pouty and miserable. And then tonight, he’d scheduled a major speech of his own to react to Shumlin’s address — only to be bigfooted by Donald Trump. I’m sure he’ll still draw a crowd of the Republican faithful, but he’s not gonna get much media attention. It’ll be lots of Trump and a goodly helping of Shumlin, with Scott hoping for a few crumbs off the table. 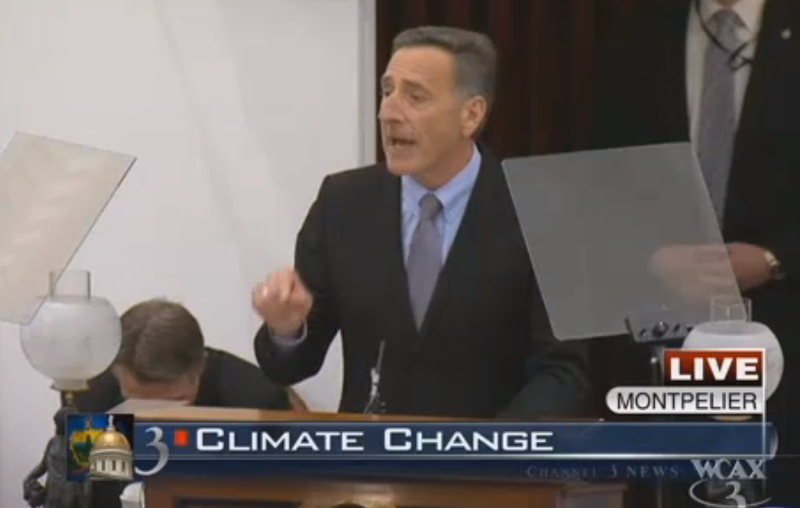 Phil Scott Trying Not To Be Seen during Shumlin’s climate remarks. Screengrab from WCAX-TV. This entry was posted in 2016 election, Peter Shumlin, Phil Scott and tagged Bill McKibben, climate change, State of the State, WCAX on January 7, 2016 by John S. Walters. Is Peter Shumlin starting to act like a lame duck? It would seem so. To judge by this week’s paltry trinkle of news, he looks to have one eye fixed on the past and the other on his post-gubernatorial future. And he’s already given up on fixing one major debit in his administrative ledger. As VPR’s Bob Kinzel reports, Shumlin opposes any tax increases to pay for Vermont’s burgeoning Medicaid bill, but he doesn’t want to cut eligibility or benefits either. In fact, he’s washing his hands of the whole mess. “…once I’m safely ensconced in the private sector with my lissome new bride,” he might have added under his breath. Yeah, screw the 2016 session. The Governor, you see, proposed a Medicaid fix last year and the Legislature ungratefully rejected it. So he’s done his duty, and hereby washes his hands of the matter. This entry was posted in 2016 election, Government, Health care reform, Peter Shumlin, Vermont Democratic Party and tagged Bob Kinzel, Earned Income Tax Credit, Medicaid, single-payer health care, State of the State, VPR on December 31, 2015 by John S. Walters.